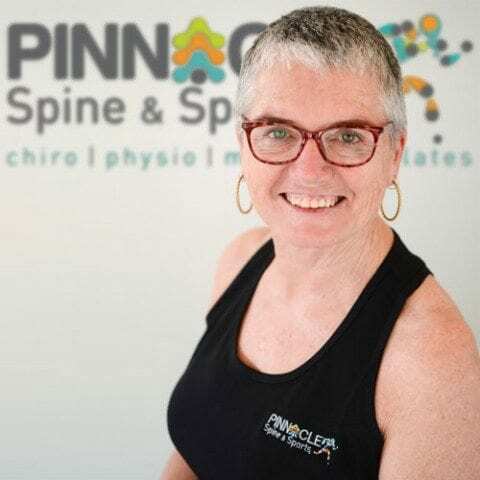 We’re incredibly lucky to have the immense skills of Gayle Wakeling-Taylor here at Pinnacle Spine & Sports. Gayle has over 30 years experience in the fitness industry, and in that time has been able to provide rehabilitation and core strengthening work to literally thousands of clients. She is a professional dancer and teacher, and specialises in treating people with disabilities and spinal dysfunction through Pilates, massage and vibration training. Gayle has the ability to give individual attention to a class of varying ages and stages, and makes you feel completely comfortable with your own abilities. She has an extensive comprehension of physical abilities & limitations, and is able to tailor exercises in a group to accommodate any problems. Her enthusiasm and encouragement enable her to quickly develop a good rapport with her participants, and her Pilates class members always comment on the immense benefits they have received from the work she has been able to provide. Click here to find out more about the Matwork Pilates classes.